If you Googled your business name right now, what would you find? Are you dominating the SERPs with your products and services when people are searching for it? Google is changing and improving the results that are served up when people are searching; location matters more than it ever has before. As Google strives to offer users the best personalized results, local search trends will only continue to influence SEO. Have you assessed how your business is viewed in locally? Are your business listings accurate? Are they complete? 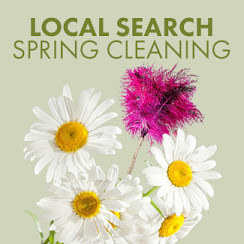 If they aren’t or you are not sure then it’s time for a some Local Search spring cleaning. First off, let’s chat about what local organic search actually is. In Local SEO, the search engines use ranking factors such as Name, Address, and Phone Number (NAP) as well as customer reviews to inform where businesses are placed in the SERPs. As part of Local SEO, NAP is going to play a huge role. You want to make sure that all your business listings include NAP and that NAP looks consistent across all your listings. Now let’s get to cleaning! Spruce Up Your “Big Three” Local Profiles - The main three directories you want to check out when you’re cleaning up your local profiles are Google+ Local, Bing Places, and Yahoo Local. On these profiles, ensure you have consistent NAP, a keyword rich business description, photos (and videos if you have them! ), your hours of operation, information about your products and services, and make sure your logo is clean and crisp. Dust Off Your Directories And Local Citations - If you don’t have a lot of time to invest in cleaning up your local business profiles you at least want to make sure your business is listed in the most important directories. These are the ones that carry the most weight in the local search algorithm. These are directories like Localeze, Infogroup, Acxiom, and Factual. Each of these local data providers includes an even larger network, which is why it’s so important to ensure your business listings are current and accurate. For a great visual of this local SEO “ecosystem” check out this great infographic by Moz. Take the Magic Eraser to Your Maps - Too bad there wasn’t a magic eraser for this stuff, right? We just love those things so darned much! For the most part, if your “Big Three” local profiles are correct, the maps should follow suite, but it doesn’t hurt to check out how your business is listed in a few maps/mapping sites. If it’s incorrect there is usually a way that you can submit a change from that screen. Put Some Elbow Grease Into Your Social Networks - Your social profiles, like Facebook and Pinterest, allow you to list your business location. Double check your social profiles to make sure your business NAP is listed correctly here too! Think of social profiles this way, if there is a field available to enter information, do it! The more data you offer about your business, the easier it can be found when people are searching for it. Ask For Help For the Tough Jobs - Reviews play a key role in the local SEO algorithm. We recommend including asking for reviews in your business process. After you know you have a happy customer or client, ask them if they could review your business. Or, a few times a year, reach out your loyal customer base via an email campaign and ask for them to submit a review. Reviews, especially all the good ones, are great for boosting your local profiles in the SERPs. "I do business nationally, not just locally. I don’t need to worry about Local SEO." "My business is a factory, I don’t need to worry about Local SEO." "I am already in a bunch of directories. I don’t need to worry about Local SEO." WRONG! Think of local search as one piece of the Organic Search pie. There are hundreds of ranking factors that go into SEO and local search is one of them. This is something your business should care about, even if it isn’t a brick and mortar store or even if you do business on a national or international level. You need to proactively ensure that your business listings are available, up-to-date, and complete so that, no matter how or when someone tries to find you, there you are! Just like your spring cleaning, once you’ve updated your social profiles, it feels great when it’s done! But it’s not an easy task (spring cleaning only happens once a year, right?) We understand how time-consuming claiming and updating your local business listings can be which is why we have a great solution for our customers. Recently we began using a tool to make local presence management so much easier (and faster!). Using our new service we can ensure your business is properly listed in directories, data aggregators, social profiles, review sites, and map listings. To see how your business stacks up locally, generate a free report and contact us today!